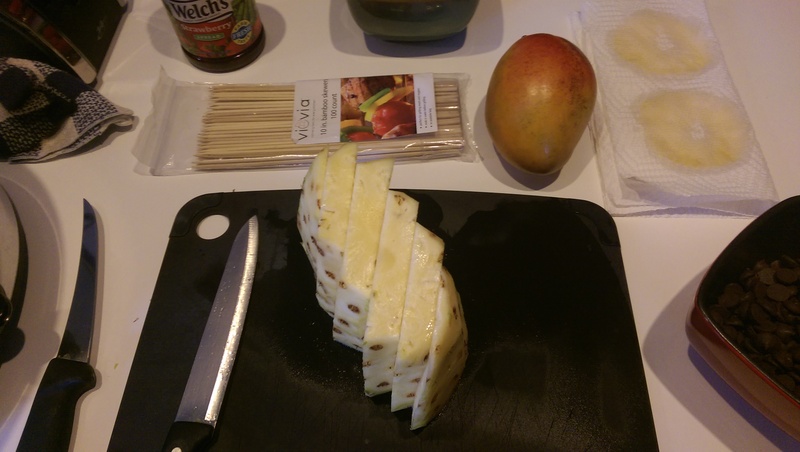 Nevermind the mango; it was going to go bad and needed to be cut up. I’m not sure how it snuck itself into this setup. 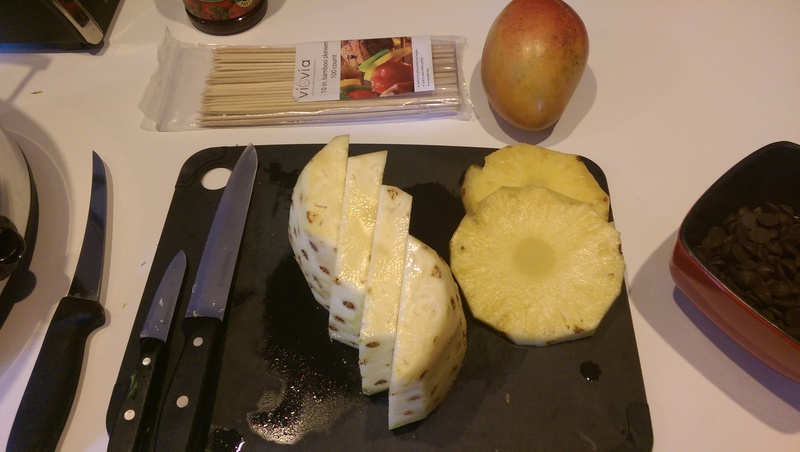 Start by cutting away the spiny outer casing of the pineapple. You will need a large, sharp knife for this. The key to this is to remove the bare minimum to get as much pineapple as possible. You should see little brown eyelets all over the fruit; leave this on for now. Cut along the curve of the fruit rather than making an up/down slash. This is not Fruit Ninja. Even though we’d like it to be. Sweet Mother, this thing is juicy. Keep a roll of paper towels or a clean washcloth handy to wipe away the excess juice every now and again. Really glad the sink is behind me right about now. Chef’s Note of Facepalm: When setting pineapple circles aside, press between several layers of paper towel to remove excess juices. I ended up regretting not doing this later. Oi. Just keep wiping away that excess juice. Emphasis on TRUST ME. Set aside end pieces for later. At this point, a little cleanup is necessary. Wipe your cutting board down and press all slices between layers of paper towel. Spoiler alert: removing this excess liquid will keep fruit from expanding too much in the freezer. Less expanding = less cracked chocolate coating = GOOD. Chef’s Note of Facepalm: I was not thinking about this until everything had been in the freezer for half an hour. Stupidstupidstupid. Enlarged for detail. To promote structural integrity, I would not recommend making the tail thinner or more zig-zaggy than this. Yeah… zig-zaggy is a word now. 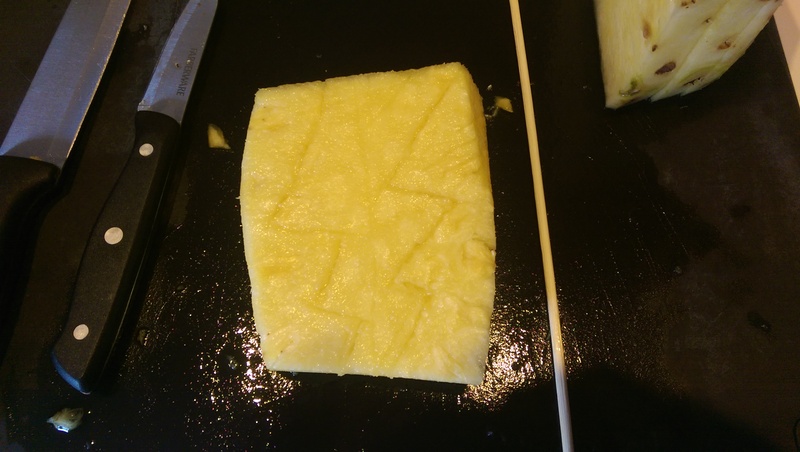 Trace out your Pikachu tail outline on one side of the remaining three slices. 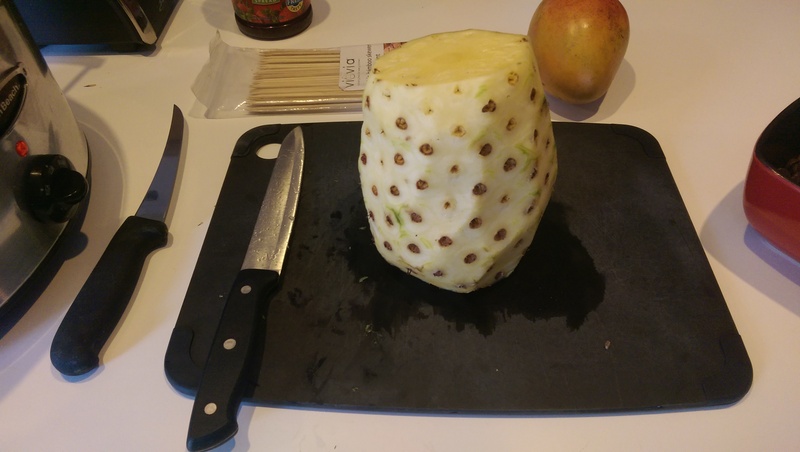 Carefully cut away the excess pineapple so that only the ‘tail’ remains. I used a special knife for this to keep the cuts crisp and precise. DO NOT OVERLAP YOUR CUTS INTO THE TAIL. If this happens to any of the tails, eat your shame and tell no one so no one will know the difference. The structural integrity has been compromised and it is not salvageable. 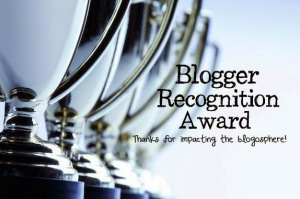 (I did. -1 tail, +1 happy belly.) Set your cut tails aside on aluminum foil. Take one of the vertical pineapple ends and make three horizontal cuts for a total of four (about 1/2″) pieces. 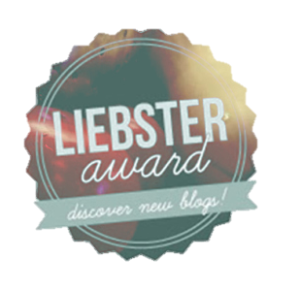 You will probably have some leftover. 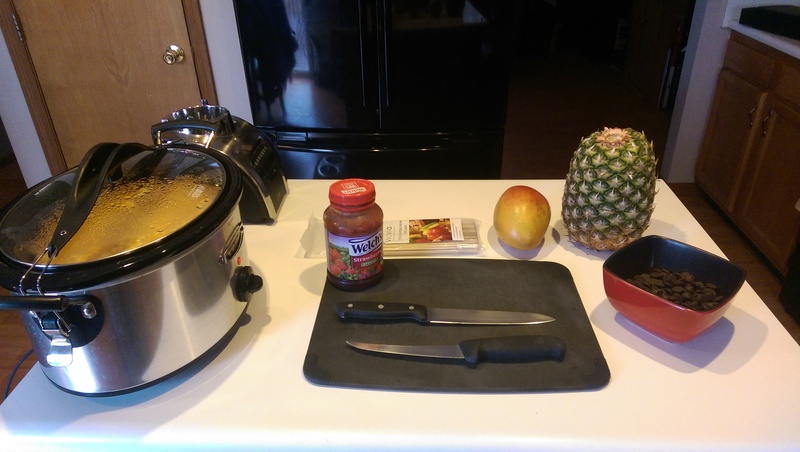 Any leftover scraps of pineapple should be saved in a separate bowl for later. Unless you hate pineapple and are making this as a gift. Pineapple-hater. 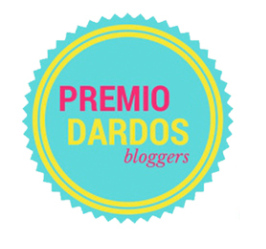 Yes, I’m judging you. 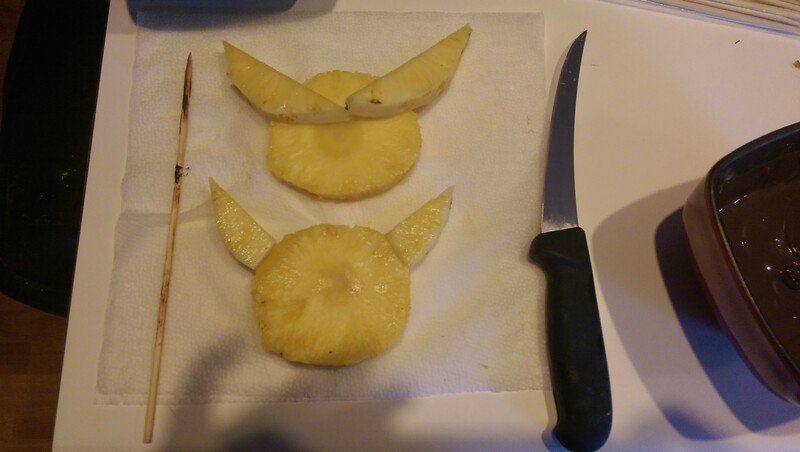 These slices will become Pikachu’s ears. This should be what you have so far. Spare square bowl is for scraps. You are saving them, right? Now it gets a little tricky: Pikachu’s ears are not going to stay on like that. 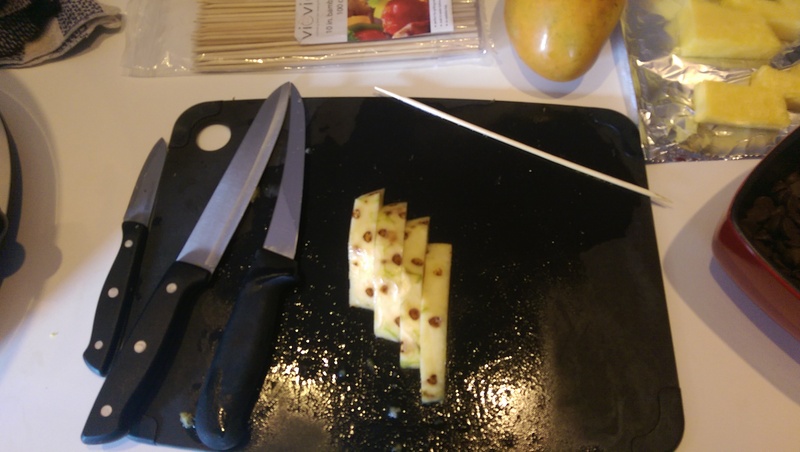 Take a skewer and break/cut it into four pieces of equal length. Poke a hole in the 10 and 2 o’clock positions on the outer edge of your Pikachu heads with skewer segment; remove skewer, Poke another hole in the flat base of your Pikachu ears. You should be able to insert the skewer pieces into the heads and attach the Pikachu ears now. When doing so, do not push the ears flush with the head; leave a small gap. 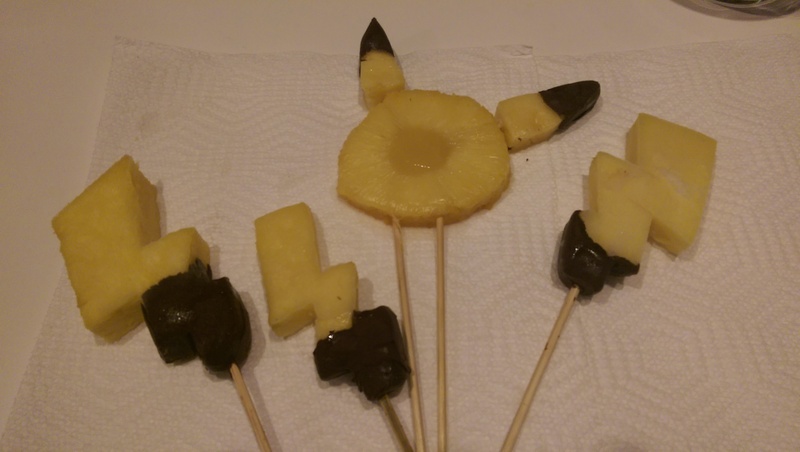 Next, insert two full (unbroken) skewers into the bottom of your Pikachu heads for stability. When inserting these, make sure your skewer goes into the tough core of the circles. Make a single ‘test hole’ in the bottom of your Pikachu tails as well. You’ll want to insert these skewers at a slight angle to prevent skewer from piercing through fruit. Remove skewers from the bottom of your heads and tails and set aside. Freeze ears, heads, and tails for about 30-60 minutes or until solid. Empty chocolate chips into microwave safe bowl and microwave in 30 second intervals until melted; my small bag took a full minute. Stir. 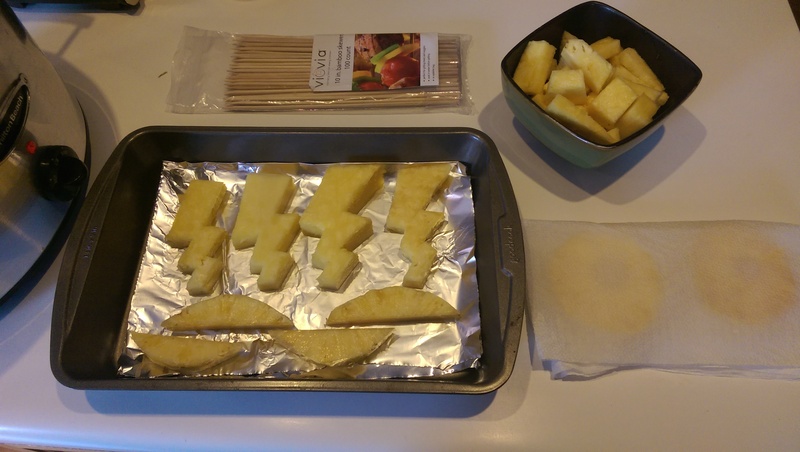 Remove frozen pineapple from freezer. Remove ears from heads, leaving skewer pieces in ears. Dip ears about one-third to halfway into chocolate (depending on size). 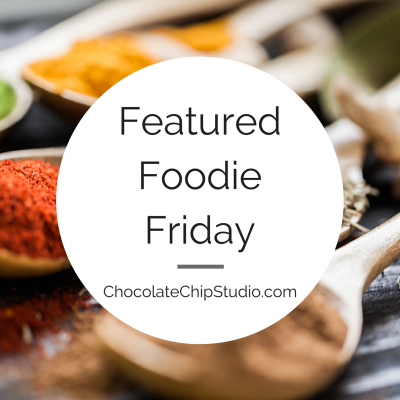 The chocolate will begin to solidify almost immediately on frozen fruit so work quickly. If (read: when) you get any unwanted chocolate buildup, take another skewer and gently run the skewer along the side with the buildup to remove the excess. Set finished ears on aluminum foil. Using the same foil for this part is perfectly okay as long as you flip it over. Dip base of tails into chocolate, again using a skewer to remove excess chocolate. When dipping your tails, you may need to use a spoon to cover the nooks and crannies. Your chocolate should cover 1/3-1/2 of your tails. I let some of these dry upside down. How’s that for balance? Once your dipped ears and tails are solidified it’s time for assembly. 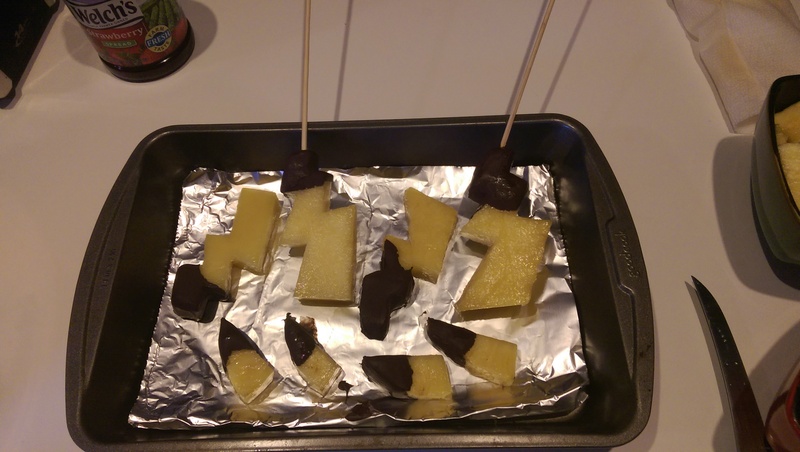 Chef’s Note of Facepalm: Before inserting skewers into tails through your original ‘test holes’, dip about 1″ of your skewer tip into the melted chocolate. 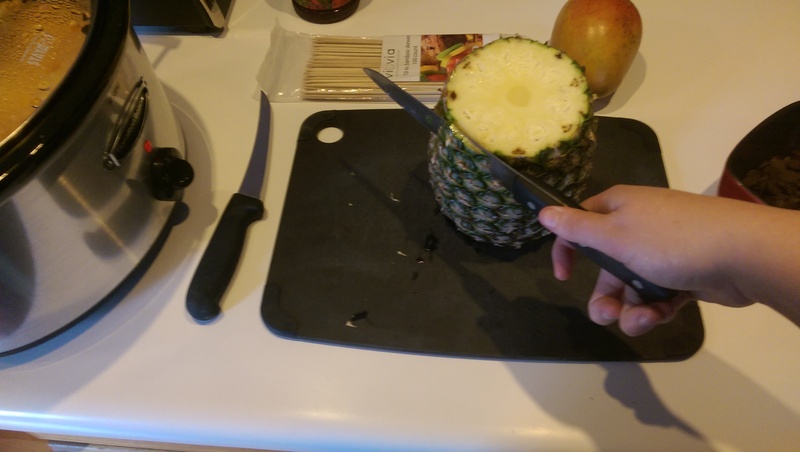 This will act as a stabilizer and will prevent your pineapple from sliding off easily. Do the same when reattaching the ears to the heads and re-inserting the dual skewers into the base of the heads. This is pretty basic stuff and I’m kicking myself for neglecting to do this. Freeze your finished product one last time for 30-60 minutes. If you were diligent about your excess juice removal you should experience little to no cracking. 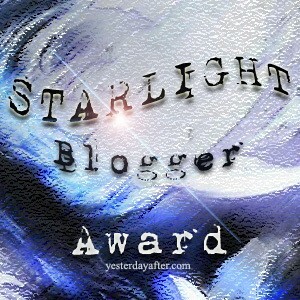 Miraculously, only one of my tails cracked, but it was not noticeable. Whew. Once finished, these should be eaten quickly. Store any uneaten heads and tails in the freezer; do not leave out or in the refrigerator. Due to not following Chef’s Notes of Facepalm, I was reduced to three tails and one head. Still scrumptious, though. You still have a bunch of leftover melted chocolate, right? 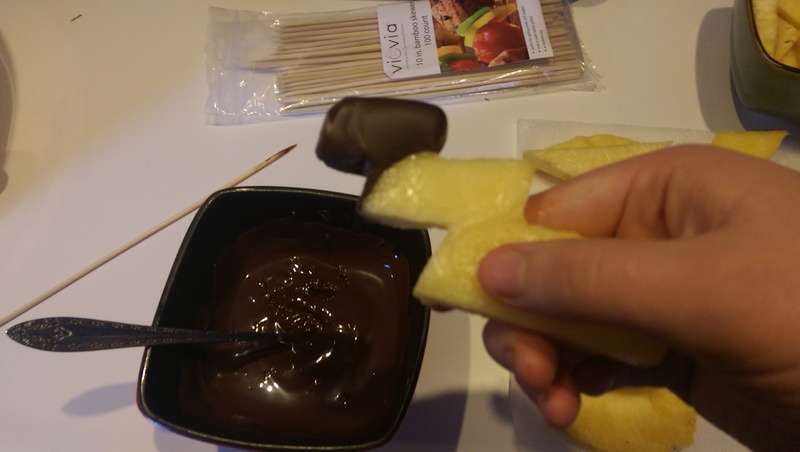 Feel free to dunk your scrap pineapple into your remaining chocolate as well. It’s a double treat! 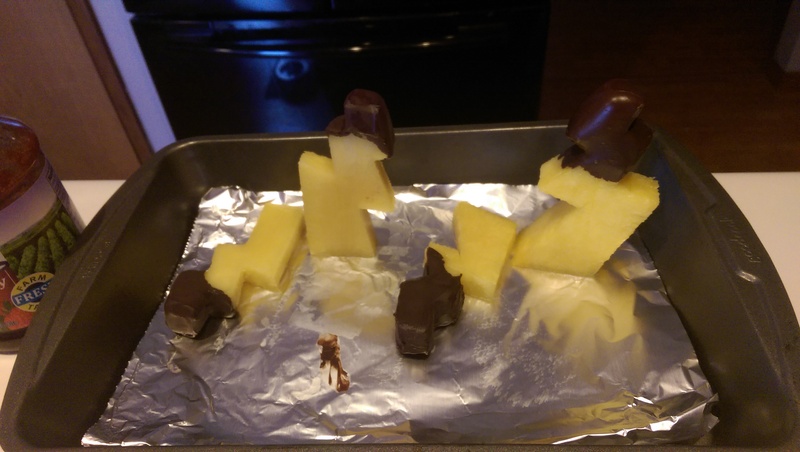 As you can see, removing extra liquid and using chocolate to secure your pieces together is key to your little Pikachu’s turning out the way you’d like them to. Regardless of my personal frustrations, these were really fun to make and I wouldn’t hesitate to buy another pineapple to try again. As always, let me know what you think! Your feedback is appreciated and I’d love to turn your suggestions into recipes!